With so many Hong Kong martial arts films about, the pro-democracy protesters surely must know a number of ways to turn their umbrellas into a weapon. Ludicrous at it sounds, at least one lawmaker in Hong Kong is advocating that line of thinking. 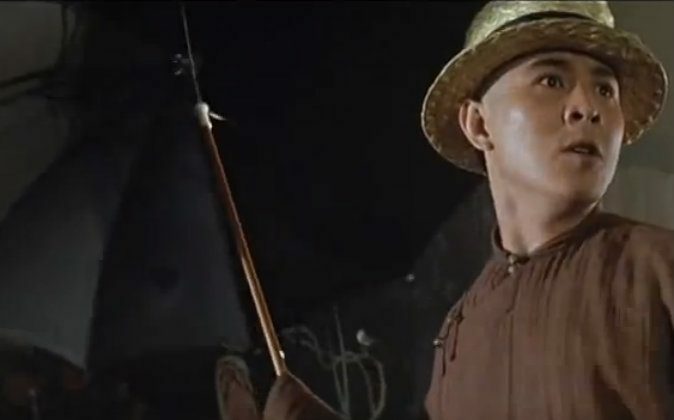 In the fictional movie about the legendary Foshan kung fu grandmaster and folk hero Wong Fei-hung, Chinese actor Jet Li (playing Wong) expertly wields his umbrella to take out multiple foes. In the history (actual, and not fictional, happenings) of the Umbrella Movement, protesters have only ever whipped out their umbrellas as a defensive shield against police tear gas, baton charges, and of course, to get some personal shade from the scorching mid-day sun. Still, because a character on the silver screen has demonstrated uncanny martial arts skill with the umbrella, that makes it potentially more dangerous than tear gas, at least in Leung’s world. Reports of deadly umbrella-swinging student and citizen protesters have yet to surface, but assuming there are such legendary characters, they all conveniently went missing when Hong Kong police started violently clearing out protesters in the wee hours of Tuesday (Oct. 14) morning. In response to police and Leung Che-cheung’s accusations, protesters did up a bogus “violent umbrella” kung-fu umbrella. Police are clearing out the barricades on Monday, October 13.